Waterproofing of roofs that are made of old bitumen old or older membranes. Waterproofing of new decks with several levels or complex geometric shapes. 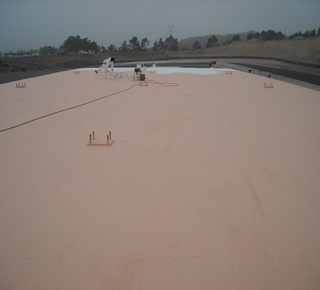 Waterproofing difficult or complicated areas where a membrane bitumen could not be used. Prenopol is a color polyurethane polymeric product, waterproof and resistant to high temperatures. Prenopol, polymeric coating, is applied in a thick, continuous layer. Once dry it becomes a highly elastic membrane by their appearance and finish can be left in a decorative manner. Prenopol, polymeric coating, prevents water penetration and extends the life time of the roof. Prenopol, polymeric coating, has a high solar reflectance. the surface must be clean, strong and leveled as possible. 1. A first layer of white Prenopol mixed with water in a ratio of 1:1 using a quantity of 250 g/m2. 2. A gray intermediate layer of 1.5 to 2.0 kg/m2. 3. And a white top layer of 1.5 to 2.0 kg/m2. All layers can be applied by brush, roller or airless. Drying time varies from 4 to 6 hours between coats. - Adhesion (ASTM C794): Excellent for bitumen, aluminum, bitumen, etc..
- Bacterial attack (ASTM G21): good. Each color is supplied in separate containers. Store in covered area, avoiding direct sunlight. Protect from extreme temperatures.